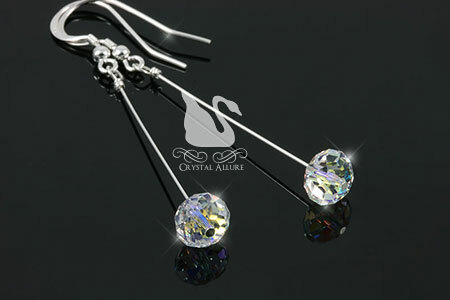 Crystal Ice Earrings: Have a Glamorous Holiday and New Year! It's the most wonderful time of the year! The holidays are here and so are all the parties. Sometimes, these parties are scheduled last minute. Yikes! What's a girl to do?! Well, if you are wearing one of our glamorous pairs of Original Crystal Ice Earrings, you are ready to go (with a dab of lipstick, of course!). 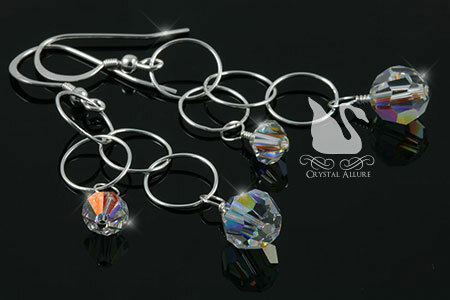 Each one of these crystal earrings are designed with iridescent aurora borealis Swarovski Crystals. For that reason, you can wear these lovelies whether dressed casual or to glam up that LBD (little black dress). Easily take your outfit from day to evening with this single accessory. These handmade beaded earrings are ultra-light, delicate and elegant. The perfect grab-and-go wardrobe accent! Aurora Borealis Swarovski Crystals are accented with sterling silver Bali beads and they twinkle like tiny stars in the night sky. Crystal Earrings are finished with sterling silver ear wires. Length is 1/2 inch from the bottom of the ear wire. Our unique twist on drop style earrings give you handmade crystal slider earrings that will sparkle in the sun and under the party lights! Featured in this beaded earrings design (above) are aurora borealis (AB) rondelle Swarovski Crystals that slide along a sterling silver wire, yet dangle with feminine ease. 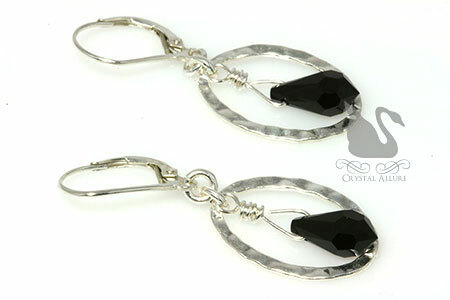 Crystal Drop Earrings measure 1-1/2" from the bottom of the earwire. An elegant pair of handmade beaded earrings pair the beauty of both Swarovski Crystals with Swarovski Pearls. 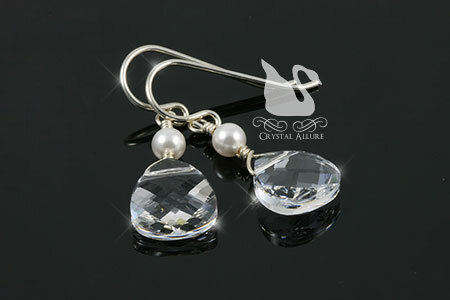 Design features a delicate 11x10mm flat faceted crystal briolette with pearl accent on sterling silver ear hooks. Crystal Drop Earrings measures 3/4" from the bottom of the earwire. Add a little feminine flair to your outfit with these handcrafted contemporary chandelier circle earrings. Design features two different shaped aurora borealis Swarovski Crystals dangling from sterling silver circles and french hook ear wires. Crystal Chandelier Earrings measure 1-1/2" from the bottom of the ear wire at longest point. Go ahead shake your hair back, you can't help but want to show off these beautiful cascading crystal earrings! 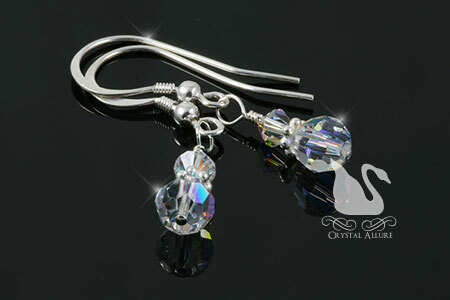 They can also be customized in crystal colors to match your wedding or special occasion event. Contact us to discuss customization options. The month of December is the official kickoff of all the holiday parties with friends, family and coworkers. Always be holiday ready for that last minute invite with these sparkling drop earrings that easily transition from daytime to nighttime for that just right festive touch. All is Merry and Bright -especially in these sparkling Swarovski Crystal Drop Earrings in either elegant jet black or holiday red! And don't worry when the parties are over these holiday jewelry earrings will fit right in with your favorite pair of blue jeans! Enter your next holiday party with all the glamour of the season in these handmade crystal earrings. An elegant black jet 11x5.5mm Swarovski Crystal briolette gently jingles against a hammered sterling silver oval hoop on sterling silver leverbacks. Earrings measure 1" from the bottom of the ear wire. 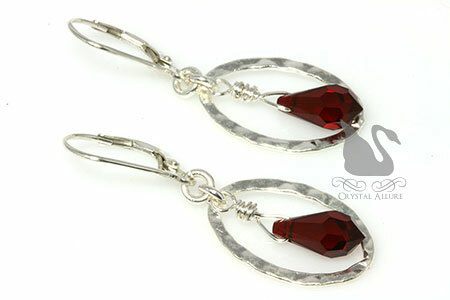 Or be festive and sparkle in these holiday red handmade crystal earrings! A cheerful red siam 11x5.5mm Swarovski Crystal briolette gently jingles against a hammered sterling silver oval hoop on sterling silver leverbacks. Earrings measure 1" from the bottom of the ear wire. Weddings always bring such excitement to the air! It doesn't matter what season you marry in as all of them offer a beautiful backdrop to any Brides' vision of her special day. I had received a wonderful email from a long-time customer, Mary Kay, that her daughter was getting married and they needed wedding jewelry. The request was for five Custom Bridesmaids Jewelry Sets, a Custom Bridal Haircomb, as well as, a Mother of the Bride Bracelet and Hairpins for Lauren's summer wedding. I just love working with Mary Kay and being able to work with her again and her beautiful daughter was such a pleasure! Both Lauren and Mary Kay were so kind and generous to send me some photos of the lovely day! Each of the girls in the wedding party received a necklace and coordinating pair of earrings created with burgundy Swarovski Crystals, champagne bronze Swarovski Pearls and 14 karat gold fill chain and ear wire. The necklaces for the two Maids of Honor included a centered golden crystal shadow Swarovski Crystal Briolette drop. All the girls earrings included this same crystal drop. 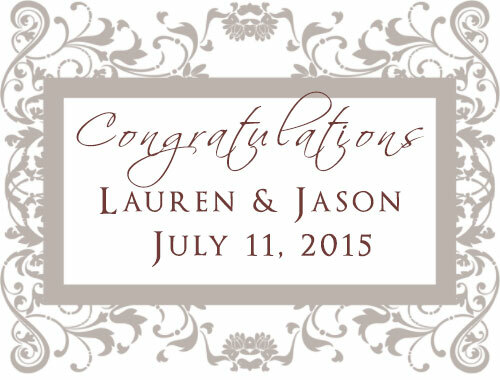 Congratulations to both Lauren and Jason! May you have many happy, fulfilling years together! 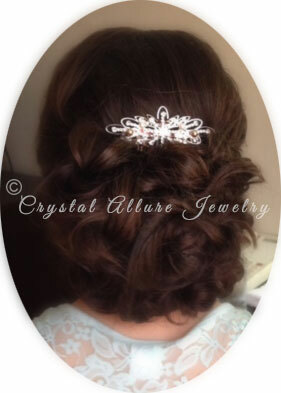 And thank you to both Mary Kay and Lauren for choosing Crystal Allure for their custom wedding jewelry. It was such a pleasure to work with you both! It has officially began to snow here in Upstate New York. But, that isn't going to stop me from sharing these beautiful custom bridesmaids jewelry sets created for Lauren for her summer wedding. After a few design reworks the sets turned out perfectly. Initially Lauren's jewelry design idea incorporated five crystal drops along the necklace and she was thinking of having this beaded necklace design for all the girls. But, after sending her some pictures she had second thoughts about this style and felt it might be too much for what she envisioned. So I suggested maybe just putting the two Maids of Honor in the drop style and the simple strand for the rest of the girls. She loved the idea! Shown above are the five bridesmaids jewelry sets that include for 2-Maids of Honor and 3-Bridesmaids. 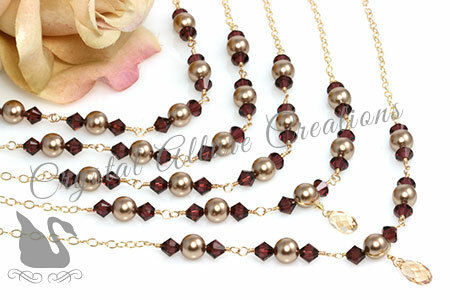 These custom wedding jewelry necklaces were created with burgundy Swarovski Crystals, bronze Swarovski Pearls and on two designs a single Swarovski golden crystal shadow drop. The Maids of Honor necklaces were designed in 14 karat gold fill chain and wire, burgundy and crystal golden shadow Swarovski Crystals and finished with our gold signature jewelry tag. Necklace length is 17". The three Bridesmaids Jewelry necklaces were designed in the same materials as the Maids of Honor except the crystal golden shadow Swarovski Crystal drop in the center was eliminated. This allowed for a classic, elegant simple beaded necklace strand. Necklace length is 17-1/4". 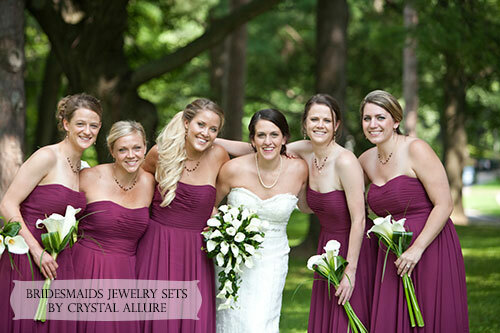 With the Bridal Party Earrings, Lauren decided to have all five girls with the same design. The only difference was the Maids of Honor would have a larger crystal drop. 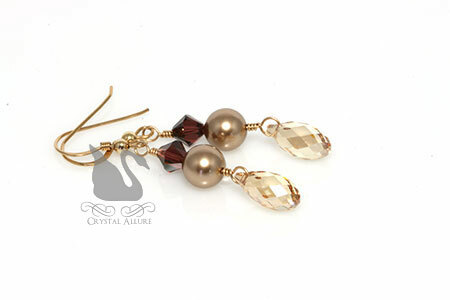 Pictured above are the Maids of Honor Earrings in the same burgundy and beige crystal pearl materials as the necklaces. The Maids of Honor earrings were 1-1/2" in length and the Bridesmaids Earrings were 1-1/4" in length from the bottom of the ear wire. Each girl in the Bridal Party received a necklace and pair of earrings, elegantly presented in a signature complementary gift box and satin ribbon. November is designated as Lung Cancer Awareness Month; White (pearl) is nationally recognized as the Lung Cancer Awareness ribbon color and; White pearls are also recognized as a symbol of Hope. ...lung cancer is the second most common cancer in both men and women, but is the leading cause of cancer death in the United States. We already know that the risk of lung cancer is higher in those who smoke. More importantly, the American Cancer Society is working diligently to get laws passed preventing children from smoking. Learn more about how the American Cancer Society fights lung cancer. Raise awareness of Lung Cancer with this beautiful white handmade awareness bracelet. A delicate chain design featuring white Swarovski Pearls and aurora borealis (AB) Swarovski Crystals wire-wrapped with sterling silver flat cable chain. Finished with a single luminous crystal dangle, sterling silver awareness ribbon charm and our signature jewelry tag. 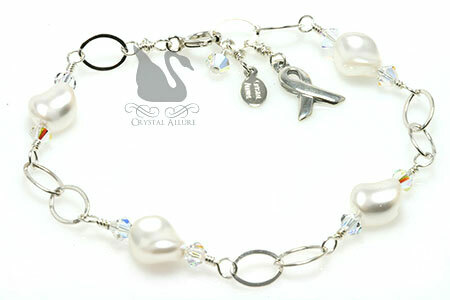 Bracelet is adjustable 7-1/4" to 7-1/2". A portion of the net proceeds of this awareness bracelet will be donated to the American Lung Association. 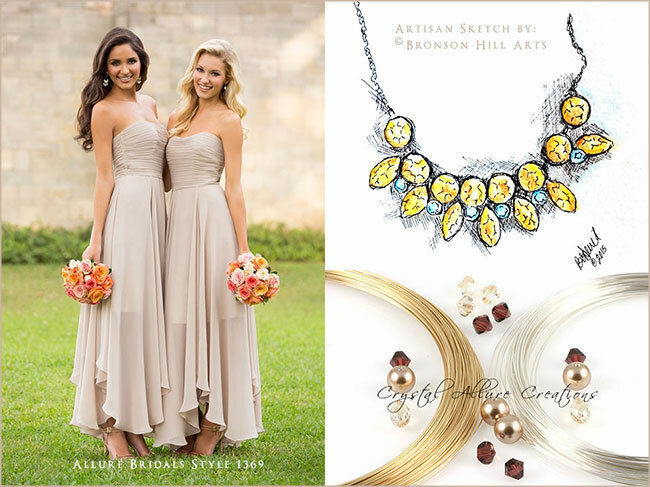 The creation of Lauren's Bridesmaids Jewelry was already in full swing and the designs were on track for completion. 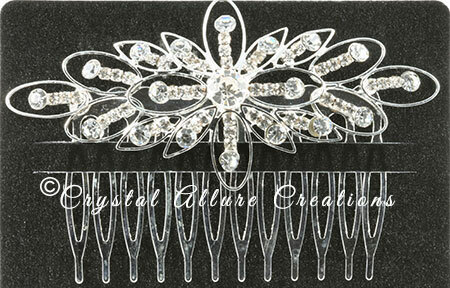 With just three weeks until the wedding, Lauren contacted me to ask if there would be time to design a custom bridal hair comb. We discussed the specifics about what style she was looking for and how she planned to have her hair styled for the wedding. She really wanted to incorporate the bridesmaids jewelry into her hair piece somehow. There was no time to waste and so I got to work on making sure Lauren had the most beautiful bridal hair comb to wear on her wedding day! Looks good to me! Work your magic!! In the interest of time, it was also the perfect solution. What emerged from my idea was a sparkling rhinestone starburst hair comb transformed into a handmade crystal and pearl bridal hair piece! 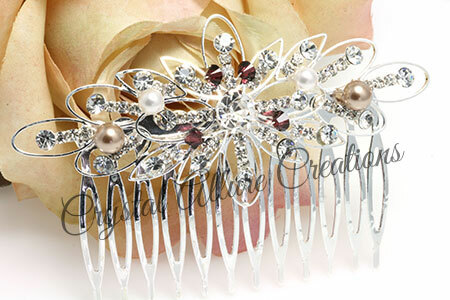 A scattering of the bridal party's burgundy Swarovski Crystals and champagne bronze Swarovski Pearls, along with a few bridal white Swarovski Pearls were each wire wrapped to a silver hair comb. The comb measured 3-1/4" x 2-1/4". On Lauren's wedding day, both her and Mary Kay were so kind to think of sending me pictures. It's such a busy and important time for both mother and daughter -and for them to think of sending me pictures just fills my heart. I am so appreciative of their gesture! These moments are what truly gives meaning to my jewelry designs and inspires me to create. So, although my customers thank me for designing beautiful jewelry for them -it is really I who should (and do!) 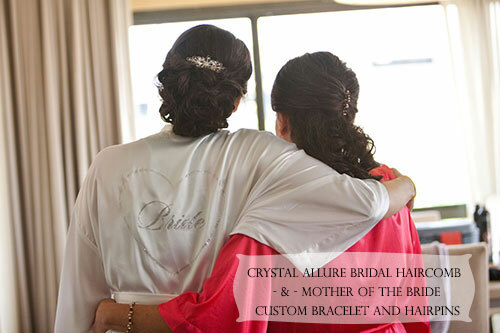 thank them for choosing Crystal Allure to be part of their special moments with my custom jewelry designs. Designing these wedding jewelry pieces was so much fun. I'm passionate about color and the pairing of burgundy and beige was an exciting combination. 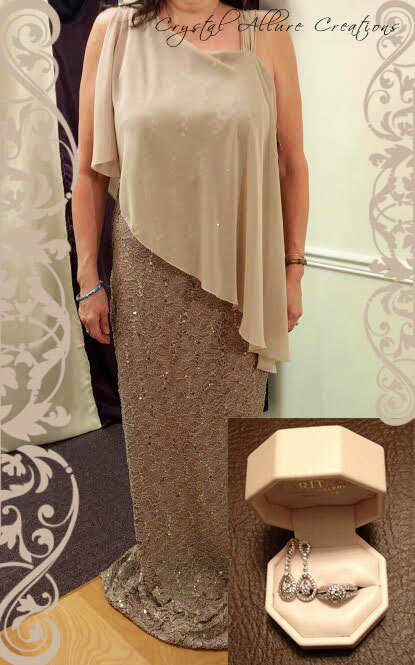 Mary Kay's dress was a champagne color and since the wedding party color was burgundy, it was, well...meant to be! In thinking about this design, I wanted to deviate a little from a full strand beaded bracelet style. Mainly because Mary Kay's dress was a sleeveless design, I just felt a bracelet with more 'umph' to it would look much better. The first go at this illusion style did not work out. But, I was not defeated. I tried a different diameter stringing wire and it worked perfectly. As well, I wanted this design to be a mix of both gold and silver metals because Mary Kay planned on wearing her mothers fine diamond ring and earrings. This clasp matched perfectly with the Halo style diamond ring. This handmade bead bracelet features an elegant sterling silver circle clasp with sparkling cubic zirconia (CZ), burgundy Swarovski Crystals, bronze Swarovski Pearls and a scattering of aurora borealis (AB) Swarovski Crystal accents delicately woven on a gold stringing wire for a sophisticated illusion style bracelet. Measures 7-1/4". Mary Kay was going to have a half up-half down hairstyle and had also requested 3-4 hairpins to match. This was the first time I've ever created these -and I loved it! These lovely crystal and pearl wedding hairpins were created using the same components as the Mother of the Bride Bracelet. 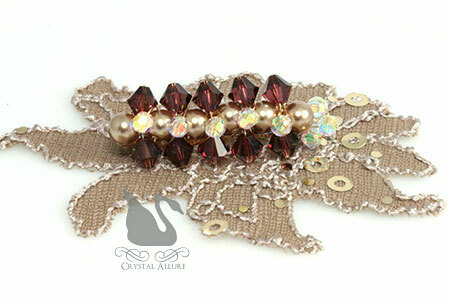 Hand wired together were burgundy crystals, champagne pearls and a touch of sparkling AB crystals. Total length is 2". This handmade bar pin brooch incorporated the wedding colors hand wired onto a 1-1/2" bar pin. Mary Kay planned on pinning this crystal and pearl bar pin on the strap side of her dress (where it was just the chiffon overlay). My little secret idea was to take a clipping of the abstract flower from her extra dress material and use fabric stiffener on it to create another pin option. Mary Kay had the option to wear just the bar pin or to use the abstract flower as a backdrop to the bar pin. She ended up using the flower backdrop with her pin and loved it!! I am so sorry it has taken me this long to tell you how exquisite I find the jewelry you designed for Lauren's wedding! My bracelet is just the right balance of classic and modern, the brooch looks great on the strap of my gown with the flower pinned behind it (great idea! 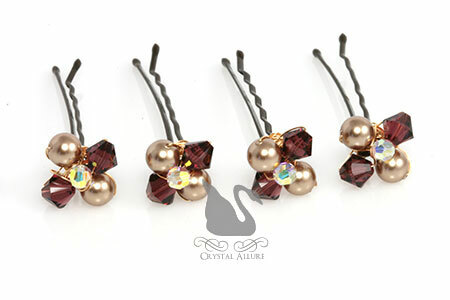 ), and the hairpins are beautiful tool. Thanks again!! Mary Kay was even so kind as to think of sending me pictures via text, on the actual day of Lauren's wedding. I was so grateful to have been a part of Lauren's special day and I absolutely love working with Mary Kay! It was nearly 4 years ago when I was first introduced to the cause of Hygroma Awareness by Elizabeth. She had requested a Custom Mothers Bracelet with Hygroma Awareness for a dear friend who had lost her child to this disease. Cystic hygromas are birth defects that result in fluid-filled sacs caused by blockages in the lymphatic system (abnormal tissue). They are most often found on babies because these abnormal growths form while the baby is still in the womb. However, a hygroma can still appear after birth and are typically found on a baby’s neck or head. In general, hygromas get larger, or grow, with your child over time. There is a good prognosis if surgery can totally remove the abnormal tissue. However, in cases where the hygroma doesn't resolve on its own (by 20 weeks into the pregnancy) or complete removal, through surgery, is not possible, the cystic hygroma commonly returns and can cause serious complications. This handmade beaded awareness bracelet was designed with rich burgundy Swarovski Crystals, representing Hygroma Awareness, accented with sterling silver beads, antique gold Bali style beads and burgundy glass pearls. Finished with a sterling silver awareness ribbon charm and our signature jewelry tag. Measures 7-3/4. 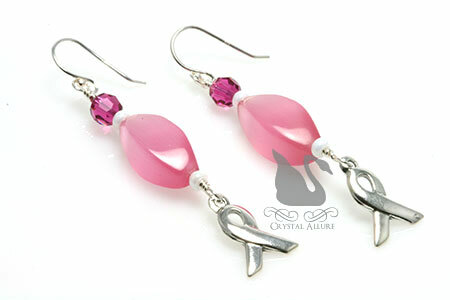 These lovely handmade awareness earrings were designed to complement the beautiful awareness bracelet shown above. 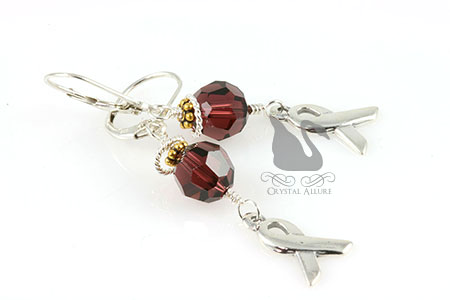 The design features rich burgundy round Swarovski Crystals accented with antique gold Bali style beads and a pair of sterling silver twist rings. Finished with sterling silver leverback ear wires and sterling silver awareness ribbon charms. Earrings measure 1-1/4 from the bottom of the earwire. In the previous post on Lauren's Handmade Wedding Jewelry Details, I shared the details and inspiration for the Bridesmaids Jewelry and Maids of Honor Jewelry. This particular custom wedding jewelry group was large enough that it needed to be broken down into various posts. But, that works perfectly because then I get to individually highlight the jewelry and design details of both the Bridesmaids, as well as, the Mother of the Bride. When Mary Kay and I first communicated, she provided me some details on her dress and also said she would be wearing her mothers' diamond ring and earrings (which were in white gold). She wasn't sure if she should have silver or gold custom jewelry created to coordinate with the white gold heirloom jewelry. This was going to be the first time I've created handmade beaded jewelry to coordinate with existing fine jewelry pieces. To be sure I created pieces that would be perfectly paired, I asked for pictures, of both the dress and the heirloom jewelry -and it's a good thing I did. It just so happened the diamond ring design was in the currently popular Halo style. While searching for those just right components I love to add to my jewelry designs, I happened across a clasp that I felt would be a perfect pairing to the ring. Mary Kay's Mother of the Bride Jewelry would be designed around two elements: her dress and her mother's diamond ring and earrings. The dress was a combination of both soft chiffon and rich lace in a champagne color. I suggested Mary Kay go with the same pearl color that the wedding party jewelry was being designed with because: (1) it would complement the fact that she, as the Mother of the Bride, was connected to the bridal party, (2) because it appeared her dress was in the same color family and (3) the chiffon top of her dress was a direct complement to the chiffon bridal party dress. Although I had seen a picture of her dress, I asked for a sample of the fabric just to be sure we'd chosen the right Swarovski Pearl color (plus I had a secret design idea brewing in my head....). The custom pieces Mary Kay requested were a crystal and pearl bracelet, hair pins and a brooch. My goal with the beaded bracelet was to create a design that she could easily wear after the wedding, whether with casual or formal wear. It was also in my plan to incorporate both gold and silver into the bracelet design. This custom jewelry order will also be the first where I've been asked for hair pins (bobby pins) and a brooch! In the Spring of this year, one of my favorite customers contacted me and I was so thrilled to hear from her and to hear the good news. Mary Kay's daughter, Lauren, was getting married! Both her and her daughter wanted to explore handmade wedding jewelry options for two Maids of Honor, three Bridesmaids and the Mother of the Bride. I've worked with Mary Kay many times over the past eight years for gemstone jewelry, as well as, custom handmade jewelry. I was so excited to be able to work with her again and to be a part of Lauren's, wedding planning. Working with Brides is so much fun. I love hearing about all the wedding details! While out shopping together, Lauren had found a necklace style that she really loved and wanted to use as inspiration for her custom bridesmaids jewelry. I had my close and dear friend, Barb Deuel of Bronson Hill Art and Photography create an inspiration sketch of that very necklace (shown above). Thank you Barb!! When the three of us met, I presented Lauren with a narrowed down selection of Swarovski Crystals and Pearls that I felt best fit her wedding vision. We discussed various design elements and bead setups that would most closely resemble the inspiration necklace that Lauren had seen. The final detail was for Lauren to decide if she wanted gold or silver metal. With her wedding colors of champagne and burgundy, she decided on gold metal. My only disappointment with the creation of these custom wedding jewelry pieces was that Swarovski did not have a larger selection of burgundy crystals. But, that didn't stop this creative mind! There were so many beautiful details put into the design of Lauren's Wedding Jewelry that I am going to be breaking them up into separate posts. Both Citrine and Topaz are recognized as November's Birthstone. However, Topaz is the modern birthstone for November and is associated with the sun. Both these birthstones are referred to as "The Golden Healers". You don't have to be born in November to wear these gorgeous handmade earrings. Topaz is such a rich, amber shaded color that it's a perfect complement to the Autumn season. In fact, these free-form glass beads bring to mind fall pumpkins. November is the time of year perfect for picking pumpkins. 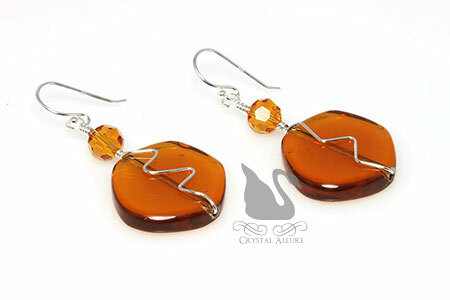 Slip these in your ears for a beautiful pair of pumpkin earrings! These handmade beaded earrings were designed with topaz Swarovski Crystals, amber topaz free-form glass beads with sterling silver wire wrapped in an abstract pattern on front of bead. Sterling silver ear wire hooks. Earrings length is 1-1/4" from the bottom of the ear wire. October is all about the color pink. Not only is this color October's Birthstone it is also the nationally recognized color for raising awareness of Breast Cancer. Pink is also the quintessential color of femininity! Which is why I am absolutely in love with this new pink Breast Cancer Awareness Jewelry. Many times, simply wearing a gorgeous piece of awareness jewelry will start a conversation which will ultimately raise awareness for your cause. 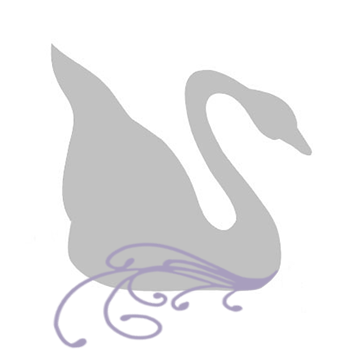 We hope you choose Crystal Allure to help you raise awareness -beautifully! With this new Pop of Pink awareness jewelry, you have three options to choose from. You can purchase the items individually; purchase the bracelet with earrings and save $5; or save $10 by purchasing the complete 3pc. jewelry set. All the pieces in this handmade beaded jewelry set were designed with Grade A fiber optic glass pink cat's eye beads, fuchsia Swarovski Crystals, white pearlized seed beads and sterling silver. Further details of each jewelry piece can be found below. What makes this set so gorgeous are the cat's eye beads. They are called "cat's eye" because of the way in which they refract light that resembles the oblong center of a cat's eye. The feature of these pink beads is how the color shift and inner glow complement the contrast of the vibrant fuchsia Swarovski Crystals. This handmade beaded awareness necklace length is 17-1/4" with a 1" sterling silver awareness ribbon charm pendant. The design is finished off with our sterling silver signature jewelry tag. Embrace your delicate wrist with this elegant handmade beaded awareness bracelet in support of Breast Cancer Awareness. Bracelet measures 8" and is finished with a sterling silver awareness ribbon charm and our signature jewelry tag. Handmade jewelry receives added dimension and style when crystals are added to the design. With nearly all Crystal Allure Beaded Jewelry Designs incorporating Swarovski Crystals, we wanted to put together this handy guide to assist you with a better understanding and appreciation for the beauty that only Swarovski Crystals offer. 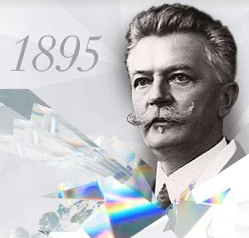 Swarovski (Swore-off-ski), founded by Daniel Swarovski in 1895, is the luxury brand name for the range of precision-cut lead crystal glass and related products. Crystallized - Swarovski Elements is the branch of the Swarovski company that offers crystal beads and rhinestones for use by manufacturers, artists and consumers in their designs. Swarovski crystal sets itself apart from the competition by offering an exceptionally exquisite, quality crystal with incredible brilliance. As well, the delicate color palette is another quality that sets Swarovski crystal components apart from others. 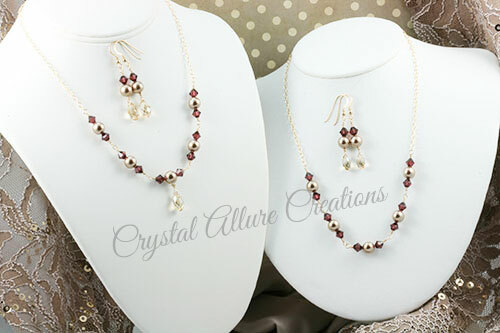 For these reasons, virtually all beaded jewelry by Crystal Allure uses genuine Daniel Swarovski crystal -either exclusively or in combination with other stones. The Swarovski Company uses only high lead content crystal glass. Typically, a full thirty-two percent of the glass is lead and lead oxide. The presence of lead increases the glasses refractive index, bringing it closer to the same sparkle that a diamond has. By cutting the glass in just the right way, internal reflection from inside the shiny surfaces of the glass cause the light to reflect internally. This internal reflection results in sparkle as the glass is tilted, adding to its beauty and to the beauty of our jewelry. The demand for Swarovski crystal unfortunately can create a host of imitators. So how can you ensure you are getting the real thing? For starters, Swarovski crystals are perfectly uniform. Since they are machine cut, each crystal is the same. This means that the height, width and slope are consistent. A hand polished imitator bead will not have as uniform a cut. Swarovski uses machinery that precisely cuts each crystal. According to Swarovski, "cutting hard materials such as crystal and gems, in such a way that they have a hundred identical facets in several directions, is a very complicated task; each direction of the reflected light must first be calculated by computer, then this has to be simulated in 3D, optimized and finally converted into control programs for complex machinery." This is just part of the technology that gives Swarovski crystals their unbelievable sparkle. The precision cutting of Swarovski machinery allows each crystal to have its facet juncture "pointing up". This means the facet junctures all meet at precisely the same point. This is a similar aspect of diamond faceting. For Swarovski crystals with the AB (aurora borealis) finish, these will have a uniform surface luster. There are no swirling marks from the vacuum process that produces the AB finish, and generally there are no scratches. The "imitations" often have scratches, swirl marks ("oily" looking surface). Some of these imperfections, in the "imposters", have to do with the lower quality of the finish. ~When you look inside the crystal, you will see no bubbles. If you see any bubbles, you know immediately that it is a fake. ~Because of its special glass compounds, Swarovski crystal will out-sparkle a bead of lesser quality when placed in a side-by-side comparison. Celestial Crystals are hand-cut, hand-polished lead crystal glass. Celestial crystal beads are highly reflective and offer a cascade of sparkling color in jewelry designs. Preciosa Crystals are machine cut crystals referred to as the "cadillac of czech glass beads". Preciosa crystal beads and pendants are characterized by their sheer variety and versatility of cuts, colors, and coatings. Preciosa crystals follow centuries old Bohemian glass traditions to ensure vibrant quality and incredible value in every genuine crystal produced. The October Birthstone tourmaline is known as "The Rainbow Gem". Written in Egyptian legend is, that while traveling to the earth’s surface these stones passed over a rainbow, and in the process, absorbed all the colors of the rainbow. Hence, tourmaline gemstone comes in a 'rainbow of colors'. The most widely popular variety of tourmaline is watermelon' tourmaline. It is both beautiful and unique in that it has a red core, an inner layer of white then an outer layer of green, giving the effect of a slice of watermelon -hence the name. Although pink tourmaline is one of the October Birthstones, watermelon tourmaline is so uniqueness it is the preferred affordable choice for October birthstone gifts. These handmade beaded birthstone earrings are designed with a gorgeously feminine pink fiber optic cats eye Grade A glass beads surrounded by silver filigree bead caps, sterling silver beads and topped off with both rose and AB light rose Swarovski Crystals. Sterling silver hooks. Length is 1-1/4" from the bottom of the ear wire. Love this design and want to customize with your birthstone? Contact us for customization.